anyway, as i promised im gonna do a series of the 4 seasons with yotsuba coz some d0rk asked..no wait demanded it...i hope you're gonna like this boing, if not *waks* bug me in a few months for the other seasons. And finish reading yotsuba alreadddddddddyyyy! Clean, crisp and simple - this wall has it all. It's another fabulous Yotsubato! vector wallpaper brought to you by tAtEkAnE. It's adorable as the 4 seasons wallpaper 'series' has always been, and even better, the vector work is flawless (the blue outlines are something that we don't see often by the way). The bright colours and simplicity brings out the energy and 'wintertime' fun evident in the wallpaper. This is a very nice work of art that deserves to be acknowledged for its originality. Keep it up tAtE! Proposed by Saikusa and highlighted by euna. What an awesome wall ^^ Its very similar to your other Yotsubato one. Clean and simple vector, it's great! it really looks like fun in there o.O this wall is jsut kickass! Awesome work with vectoring tate! This is such an original piece of work. Nice choice of colours - especially the blue outline! Tate-chan made a wall! Tate-chan made a new wall! XD & yaay! Yotsu-chaan! I miss her! This wall is very adorable, cute, & refreshing! wow, I've been seeing lots of refreshing walls this day! O.O Yotsu looks soo cute, like usual. You did a stunning vector as usuall, I always love it. Oh My Gosh, is that MILK?! Or glue? Man, I don't get it, but I still love it! The sun is also very cute! The clouds are very nice, I'm hoping to see it animated, Tate-chan. ^.^ & the font & texts are very cute~ Awsome job! I'll definately add this to my favs! Keep up the awsome work & hope to see more, Tate-chan! its obviously more winterlike! who needs coats! nice wallie..its look like comfortable to me and its color very peaceful..nice work heh.. I like the clouds cuz they look really puffy and stuff. hehe, this is very sweet wallie ^_^ your vectoring is wonderfull, lines are so clear and clean ! and the colour of lines is nice blue which goes well with the colouring of the background. white colour for the water is quite interesting choice but it works very well :) sun brings nice brightness as the colours of yotsuba's clothes. and the atmosphere is very happy. nice work and thankies for sharing ! hahah thats so adorable XD i love it, fave! 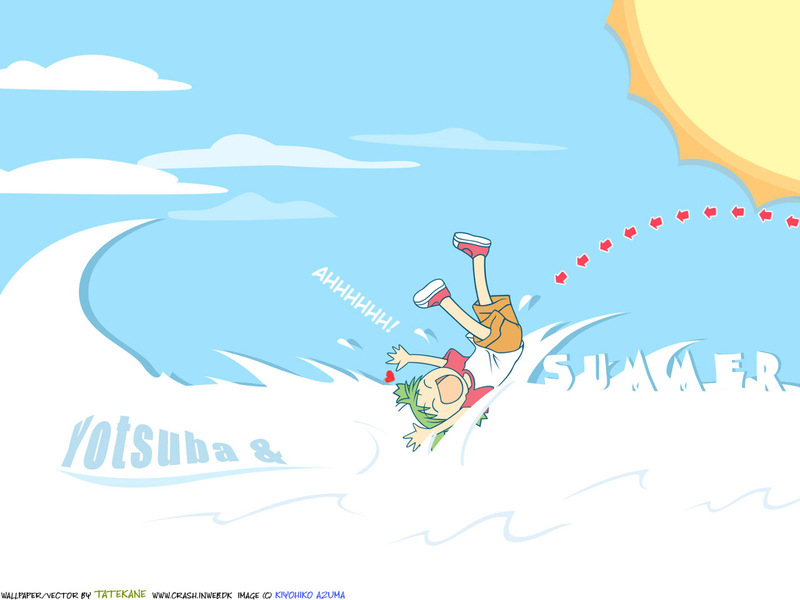 this is insanely cute, and shows the personality of Yotsuba perfectly! instant fave and on my desktop now!